Elegant, One-of-a-Kind Boutique Hotel, Perfect for Romance & Honeymoons. Nayara is a boutique hotel nestled in the forest near Arenal volcano. Nature, relaxation, and outstanding views await you. Get up to 15% off your stay, depending on your room. Valid for select travel dates in 1 May – 31 October. Save up to $165 per night. Rate per night does not include discount. Restrictions may apply. 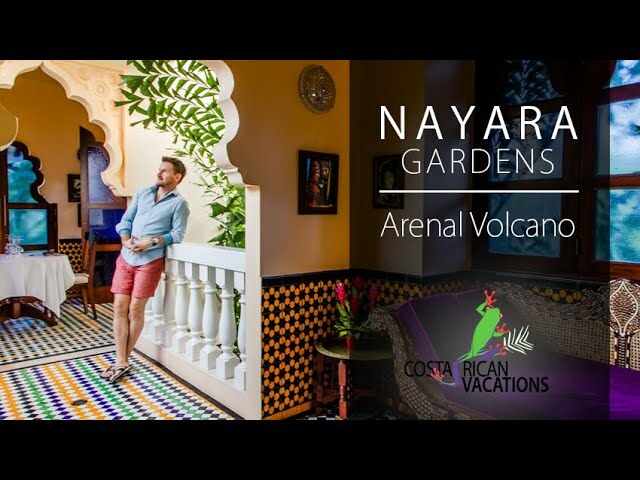 Nayara Gardens stands out among other Arenal Volcano hotels as the ideal choice for those looking for an intimate boutique experience beneath the majestic Arenal Volcano. The Nayara repeatedly wins awards for their luxurious personalized services. The hotel is comprised of 50 private casitas (bungalows), each surrounded by tropical gardens, with outdoor shower, private terrace with volcano views, and intimate Jacuzzi for two. All rooms have A/C, 32” Plasma TVs with cable, DVD/CD player, iPod stand, safe, mini-bar, and coffeemaker. Hotel amenities include complimentary WiFi throughout the property, as well as free international calls from the lobby and wine bar. Their full-service restaurant, Altamira Restaurant, serves breakfast, lunch, and dinner. The latest dining addition, Sushi Amor, is an artistic restaurant and lounge serving Asian-Latino fusion dishes. Not to be missed is the Nostalgia Wine Bar, where guests can enjoy hors d’oeuvres while sipping wines from around the world. Their swimming pool has three independent Jacuzzis and the Kali-Kali swim up bar, the perfect place to enjoy fresh tropical cocktails and snacks. Other offerings include their indulgent spa and fitness center. Take advantage of the on-site complimentary bird-watching tour twice a week and yoga daily. Breakfast is included in the nightly rate. Luxury—24 deluxe suites in separate, private bungalows with their own tropical gardens. Enjoy waking up every morning to a majestic view of the 3,500 ft Arenal Volcano. Romance—Private rose petal baths and candle-lit dinners, perfect for couples! Wine—Nostalgia wine bar, where guests can sip the best of Latin American and Spanish vintages and enjoy hors-d’oeuvres. Fun—Enjoy some of Costa Rica’s finest fresh fruit cocktails at the poolside sunken bar or cocktail bar and lounge. Exquisite Dining—Altamira “High View” Restaurant serves a variety of international cuisine and offers breathtaking views of the volcano. Relaxation—The spa, perched above the tropical rainforest, is fully functional, offering a variety of treatments such as massages, facials, and Jacuzzi therapy. Courtesy—Unlimited free international calls to anywhere in the world! Sustainability—Earned Level 4 CST (Certificate for Sustainable Tourism) through Costa Rican Tourism Board.